In early April, a group from an undergraduate Engineering Design course contacted the IPCH Digitization Lab concerning the prospect of 3D scanning objects held in the Yale Collection of Musical Instruments. The group of five wanted to focus their efforts on developing a final project that would bring some of the collection’s rare instruments to the forefront for interpretation and interaction with the public. They decided to scan select instruments in order to create 3D models and 3D print outs for incorporation into an interactive museum kiosk. A few objects from instrument groups that are less represented in the museum’s halls were selected for scanning from collections storage. The students coordinated with the Susan Thompson, a Curator at the collection, as well as collections interns, Kelly Hill and Katrin Endrikat for transportation and handling of the instruments. Once on the West Campus, instruments, crecelle and sansa, were carefully placed in front of NextEngine triangulation laser scanners for collection of data points corresponding to their exterior geometry. A student learned about the scanning process from the Digital Imaging Specialist, who guided him through acquiring data for their project. Another student later continued scanning. Post-processing and work on the kiosk and user interface was shared by the group. Creating 3D models, was just one facet of the group’s final project. Their ultimate goal was to design a digital interface in which they could feature the 3D models and information about the unusual instruments. In order to achieve their goal of increasing visitor engagement, the group designed a game that both educates the public and encourages user interaction. They presented their work on 29 April at the Yale CEID. The group stands behind their work with representatives from the collection, Susan Thompson and Kelly Hill as well as their teaching fellow, Matthew Reagor. From left to right: Summer Wu, Zobia Chunara, Matthew Reagor, Daniel Fischer, Kelly Hill, Susan Thompson, Trey LaChance, and Cameron Yick. Image courtesy of Zobia Chunara. A close up of the kiosk. Image courtesy of Zobia Chunara. In the late 1800s, amid the hubbub of the Black Hills Gold Rush and the lawlessness of Deadwood, a great scientific discovery was made in Dakota Territory. A specimen dealer unearthed a treasure-trove of beautifully preserved petrified tree trunks. The stout tree trunks, with diamond shaped cavities from which leaves once sprouted, were unlike any contemporary tree trunks in the area. They harkened back to an older time and were subtropical in appearance. These fossils were classified as Cycadeoidea. Cycadeoidea were very common during the Jurassic and Cretaceous, when dinosaurs last roamed the Earth. They date to a time when the global climate was comparatively warm and as a result sea levels were considerably higher. It is projected that during this period, North America was oriented about a 45 degree rotation toward the Prime Meridian and was situated closer to the equator than today. This gave present-day South Dakota a warm climate, which fostered conditions quite hospitable to Cycadeoidea. In 1898, George Reber Wieland, a paleontologist from the Peabody Museum, who was on assignment collecting vertebrate fossils in Dakota Territory on behalf of O.C Marsh, learned about the rich cretaceous Cycadeoidea trunks in Black Hills. George Reber Wieland was intrigued by the fossilized plants found here and shifted his focus to collecting and studying the 120 million year old Cycadeoidea specimens. Wieland is credited with amassing a collection of around one thousand specimens. A view of a Cycadeoidea fossil locality in South Dakota in 2012. Image taken by Shusheng Hu. This collection, still the largest Cycadeoidea collection in the world, is housed here at Yale and currently cared for by the Collections Manager of Paleobotany, Shusheng Hu. Shusheng approached the Digitization Lab in October of 2014 with the idea of digitizing the well-preserved structures of a Cycadeoidea trunk as a part of a greater conservation and research project. This project, lead by the curator of Paleobotany, Dr. Peter Crane, focuses on the origin of early angiosperms, or flowering plants. The Cycadeoidea specimens are viewed as crucial to this project as they may provide new information about the origin of angiosperms. Since these specimens are quite heavy and precarious to move, creating 3D models has the capacity to greatly aid research, teaching and exhibition! Scanning the Cycadeoidea trunk on location at the Yale Peabody Museum. Image taken by Shusheng Hu. The Cycadeoidea trunk was acquired via ShapeGrabber triangulation laser scanner on location at the Peabody Museum. The fossil was rotated between scans taken from different angles and objects were placed in the foreground to aid in alignment. Once the acquisition was complete, much time was invested in post-processing. Individual scans were cleaned, aligned and refined in order to yield the final geometry of the model. Visualizing geometry of the 3D model in MeshLab. Snapshots taken with the Lambertian Lit Sphere radiance scaling shader applied. This geometry has the potential to be interacted with and analyzed remotely by paleobotanists and enthusiasts alike. The 3D model has been incorporated into visualizations for education and outreach. The 3D model, visualizations and print of this fossil were created with contributions and assistance from Chelsea Graham of the Yale IPCH Digitization Lab, Shusheng Hu of the Yale Peabody Museum, Holly Rushmeier of the Department of Computer Science and Ngoc Doan of the Yale CEID. Special thanks must also be given to Tim White and Annette Van Aken of the Yale Peabody Museum for coordinating and providing transportation of the equipment. During the spring and summer of 2014, Peter Van Roy, an Associate Research Scientist at the Department of Geology and Geophysics funded by the Yale Peabody Museum, conducted high-resolution photography of large anomalocaridid arthropod fossils in the IPCH Digitization Lab. The fossils that Peter imaged were uncovered during expeditions in southeastern Morocco, a region to which the Yale Peabody Museum has been conducting expeditions since 2009. These anomalocaridid fossils were discovered in the Fezouata formations, which are muddy deposits that date back to the Early Ordovician (ca 480 million years old). The Fezouata deposits consist of several thousand feet of shales and siltstones that accumulated in relatively shallow waters on the shelf off the ancient paleocontinent of Gondwana over a period of some 8 million years. During the Early Ordovician, the area where the Fezouata formations formed was situated close to the South Pole. The sediments contain an exceptionally well-preserved and diverse fauna, which provide unparalleled insights into the composition and functioning of Ordovician marine ecosystems. The animals that are preserved were rapidly entombed by storm-generated mudflows and include many delicate soft-bodied forms that under normal circumstances would have no chance of fossilization. Because swimming animals could more easily escape these mudflows, the fauna is mainly composed of benthic, or bottom-dwelling animals. Among the swimming forms that have been discovered are several anomalocaridid fossils. Anomalocaridids are very early representatives of the Arthropoda, which is the most successful and diverse animal group on the planet, and includes, among many others, familiar creatures like horseshoe crabs, scorpions, spiders, millipedes and centipedes, crabs, lobsters, butterflies, ants, beetles, etc. The Fezouata specimens are the youngest unequivocal anomalocaridids that have been found to date; all other anomalocaridid fossils date back to the Cambrian period, with the oldest material being around 530 million years in age. Because they are such ancient creatures, they are of critical importance for understanding the origins and early evolution of Arthropoda. To our modern eyes, anomalocaridids look very alien: they have a head with a pair of spinose grasping appendages and a circular mouth surrounded by toothed plates; their elongate, segmented bodies carry lateral flaps which they used for swimming. It was long believed that they only had one set of segmentally arranged flaps on each side of the body, but the Moroccan material has shown they actually possessed two sets, with gills attaching to the upper set – a finding which has important implications for our understanding of how modern arthropod limbs evolved. While most anomalocaridids were predators, the biggest Moroccan specimens were filter-feeders, gently harvesting plankton from the ocean. With a size of at least up to 7 feet, they are true giants, and rank among the very biggest arthropods to have ever lived. Interestingly, they foreshadow the appearance of giant filter-feeding whales and sharks much later, and provide a much older example of massive filter-feeders originating from among a predatory group at the time of a diversification of plankton. Peter’s high-resolution photography of the Yale Peabody Museum specimens has had an impact beyond documentation. His images facilitated study of the large specimens and have led to discoveries about the construction and morphology of the creature’s lateral flaps and gills. The images also helped inform renowned natural history illustrator Marianne Collins, who worked closely with Peter to bring this ancient, extinct giant back to life through her stunning artistic renderings! For more information about Peter’s findings, please see the Yale News feature http://news.yale.edu/2015/03/11/giant-sea-creature-hints-early-arthropod-evolution Peter’s popular science article https://theconversation.com/fossils-of-huge-plankton-eating-sea-creature-shine-light-on-early-arthropod-evolution-38520#comment_619019 or delve deeper by reading his team’s recent Nature publication http://www.nature.com/nature/journal/vaop/ncurrent/full/nature14256.html ! This meteorite is quite old. Its age has been determined to be 4562.8 ± 0.3 million years! That means the meteorite predates Earth (which boasts an age of ~ 4540 million years) and is only about four to five million years younger than the first solids in our Solar System (estimated to have formed 4567.18 ± 0.5 million years ago)! After the meteorite was dislodged from its parent body, it is estimated that it spent over 20 million years traveling through the Solar System before eventually falling to Earth. As it fell through the Earth’s atmosphere, the surface of the meteorite melted then solidified, forming a crust. A few thousand years later, in 2012, a meteorite hunter discovered it scattered in 35 pieces. The largest piece was sliced to generate thin sections and bits for analysis before its owner lent it to the Yale Peabody Museum for display. This piece weighs in at 79.2 grams and measures 3 x 3.5 x 4.5 centimeters. The meteorite is dark green in appearance, with a light green crust. Over time, while resting on the desert floor in Morocco, terrestrial material precipitated onto its surface. This precipitate is manifested as areas of yellow-whitish material consisting of calcium carbonate pigmented by iron oxides and hydroxides. Upon scientific analysis, a telltale extraterrestrial signature was detected –the presence of meteoritic iron, which is quite rich in nickel. In contrast, terrestrial iron is devoid of nickel. This was an immediate indication that the rock was not formed on Earth! The meteorite is a fully crystalized rock; it is quite similar to terrestrial igneous rocks; however, both its mineral composition and chemical signature are dissimilar to any other known rock. The individual minerals are not incredibly unusual; it is simply that their combination has never before been observed in a rock. If the meteorite is not derived from the planet Mercury, it must be from a part of the asteroid belt (located between Mars and Jupiter) that has not yet been sampled! The meteorite was digitally acquired via NextEngine triangulation laser scanner in the Digitization Lab at the Yale Institute for the Preservation of Cultural Heritage (IPCH) on a Monday. By Wednesday of the same week, Stefan had a scaled 3D print in hand courtesy of the Yale Center for Engineering, Innovation and Design (CEID). The primary objective of the process was to create a digital surrogate of the meteorite for applications in packaging, exhibition and education. Stefan, who was responsible for taking the meteorite back to its owner in Germany, aimed to apply the 3D geometry acquired via scanning for creating stable and sturdy packaging. The 3D print out was used directly to mold clasps to support the meteorite in a custom-made box. The main goal of creating a high-resolution 3D model was to print a copy of the meteorite in order to keep a tangible, tactile version of it at Yale. Stefan commissioned Michael Anderson, a natural history artist with the Yale Peabody Museum who also mounted the packaging clasps, to paint the 3D print. The result is outstanding! The meteorite was scanned, post-processed, printed, painted and photographed with contributions and assistance from Chelsea Graham of the Yale IPCH Digitization Lab, Ellen Su formerly of the Yale CEID and Stefan Nicolescu, Jessica Utrup, Michael Anderson and Fred E. Davis of the Yale Peabody Museum. We have all heard about Babylon. Already legendary in antiquity for its great walls, its man-made terraces of flora known as the Hanging Gardens — one of the Seven Wonders of the World — and especially for its great learning and culture. But what happens when the past meets modern technology? Recently, YDC2 had the opportunity to partner with the Yale Babylonian Collection. This collection has the largest assemblage of seals, documents and other ancient Mesopotamian artifacts in the U.S. and is one of the leading collections of cuneiform tablets in the world. This collection is also noteworthy for its close ties to an academic department where it upholds the University’s mission of teaching and learning. To learn more about the Yale Babylonian Collection, please visit their website. The major aim of this joint demonstration project is to create documentation of cuneiform tablets for application in research. Fourteen objects have been selected with a variety of themes. Here are some of the highlights: For Old Assyrian tablets, we have a marriage proposal and a fragment of an envelope. An interesting feature of this fragment is that it still retains the ‘mirror’ image of the letter it once enveloped because the clay was still wet when it was wrapped around the letter. There are a few mathematical tablets to be imaged. One is a demonstration of finding the diagonal of a square using the square root of 2. One is an unsolved math problem which scholars, to this day, are still trying to solve. We will also be imaging a letter from Nebuchadnezzar, as well as the first known example of a contract killing and a tablet containing part of the story of Gilgamesh. For the first time ever, these pieces will be imaged using RTI (Reflectance Transformation Imaging), 3D imaging and MSI (Multispectral Imaging) as well as having high resolution photos taken of them. Imaging of these objects began this week so stay tuned for the next part of this three part story! The Babylonian Collection Reading Room contains an extensive Assyriological research library. In the background is a replica of the famous Stele of Hammurabi. Photo taken by Lee Payne. Several rooms of Sterling Memorial Library were designed specifically for the Babylonian Collection, as a result the window medallions display Mesopotamian themes. Photo taken by Lee Payne. An example of an unopened envelope, with the tablet visible inside. This is a record concerning barley for beer, ca. 2100 B.C.E. Photo taken by Lee Payne. Alexander Pope: 3D model or ‘bust’! 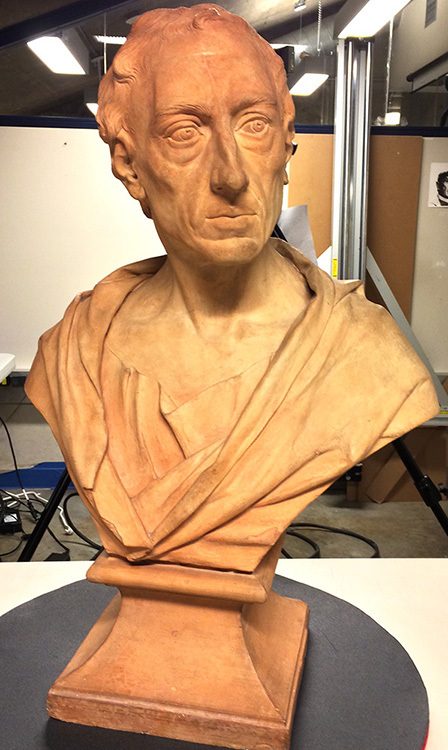 Early last summer, YDC2 worked with the post-docs to image a bust of Alexander Pope by Louis Francois Roubiliac (see our post– Have 3D scanner, will travel). On February 6, the YDC2 Imaging Lab, along with the Computer Science department, continued the collaboration with the Yale Center for British Arts (YCBA) on the second part of this project. The YCBA was planning a new exhibit: Fame and Friendship: Pope, Roubiliac and the Portrait Bust of Eighteenth Century Britain. Louis Francois Roubiliac produced eight sculptural representations of Alexander Pope which are now spread out among different collections around the world. This exhibit would be the first time all eight busts would be together in approximately 50 years. The YCBA requested the application of 3D laser scanning to yield digital replicas in the hopes of determining the chronology of the creation of the busts. The 3D models would not only give researchers surface geometry but also dimensions of Pope’s features and how the tool mark placement varied between busts. As the busts could not travel to the Imaging Lab, Jessica Slawski, Chelsea Graham, and Ying Yang set up the ShapeGrabber 3D laser scanning equipment in the YCBA. Chelsea, along with Ruggero Pintus and Ying Yang, Postdoctoral Fellows for the Computer Science department, began scanning the busts on February 6. Once the busts were unpacked, they were photographed by YCBA staff. After their photo shoot, the busts then began the 3D scanning process which took about 4 hours per bust. When this process was complete, the busts were moved to the exhibit area to be installed. Due to time constraints, only 4 of the busts were able to be 3D scanned before they were installed for the exhibit. The hope is that the remaining 4 busts will be imaged during the exhibit de-installation. The post processing of these 3D models will take up to 30 hours per bust. Once the models are done, researchers will be able to overlay the models on top of each other to compare features and tool marks. Chelsea Graham and Ying Yang set up the ShapeGrabber 3D laser scanner to start scanning the Pope busts for the Yale Center for British Art exhibit. While many of the busts were marble, this one was unique as it was made out of terracotta. Terracotta bust of Alexander Pope by Louis Francois Roubiliac. On loan from the Barber Institute. Photo by Chelsea Graham. Ying Yang and Chelsea Graham examine the 3D model of the Pope bust compiled by the scans of the ShapeGrabber laser scanner. The empty spots on the 3D model denote areas that the laser scanner was not able to reach. The bust needed to be turned so the laser could reach these areas and produce scans of the missing areas. The scans would then be added to the 3D model filling in the missing spaces. Once all of the scans of the bust have been completed, Chelsea Graham checks to make sure there are no ‘holes’, or missing data, in the 3D model. When this is confirmed, the model will then be post processed and the image ‘cleaned up’ to remove any extra data that was scanned along with the bust. Once the 3D model was completed on the computer, it was then fed to a Makerbot 3D printer. The Makerbot printer lays down layer after layer of warm plastic and slowly builds the Pope bust from the ground up. The columns are support structures for various features on the bust such as the shoulders, ears and nose. Once the bust is finished printing and is cooled, these support structures can be broken off without harming the 4 inch bust underneath. Photo by Chelsea Graham. Analytical or computational imaging offers important new tools for scholarship in the humanities. Computational imaging technologies can support the collection of replicable data about cultural heritage objects that allow scholars and conservators to answer questions about artifacts that cannot be answered by means of simple visual inspection. YDC2 is supporting a project that will use multispectral imaging (MSI) of medieval manuscripts to provide additional data about the inks and pigments used in their creation as part of the Digitally Enabled Scholarship with Medieval Manuscripts project. With invaluable support from Beinecke Library colleagues Ray Clemens, Curator for Early Books and Manuscripts and Chris Edwards, Head of the Digital Studio, last week Ruggero Pintus and Ying Yang, Post-Doctoral Fellows from the Computer Science department were able to multispectrally image the entire third recension of the Confessio Amantis,1392-93 by John Gower. These images of the Gower manuscript promise to reveal additional information about how it was written and illustrated while the set-up process was important preparation for taking the technology on the road to other repositories of medieval manuscripts. Many thanks to the Beinecke Rare Book and Manuscript Library for supporting this work. Ruggero and Ying explained that the entirety of the Gower manuscript was acquired with an 8-band, high-resolution multispectral camera and a Xenon light source that emits from ultra-violet to infra-red wavelengths, in a completely dark room. The raw data is a set of high dynamic range (16bit) images. The multispectral camera resolution is 2504×3326 pixels (8.3Mpixels), and for each multi-spectral acquisition we have eight images (one for each band). This set-up has spectral sampling intervals (about 50nm) similar to those employed by Ricciardi et al. , which demonstrated that the limited set of pigments used in manuscript illuminations can be at least separated and sometimes identified, even when mixed, by acquiring images at moderate spectral sampling intervals (50 nm) under low light levels (∼150 lux) while having high spatial sampling (∼250 pixels per in). Thus, the acquired data will allow us to study the distribution of different elements across the manuscript page, to map out similarities in measured color/material/pigment, and to achieve the more robust, objective specification of them. Ricciardi, P., Delaney, J.K., Glinsman, L.D., Thoury, M., Facini, M. & de la Rie, E.R. 2009. Use of Visible and Infrared Reflectance and Luminescence Imaging Spectroscopy to Study Illuminated Manuscripts: Pigment Identification and Visualization of Underdrawings. In: L. Pezzati & R. Salimbeni, eds. Proceedings of SPIE, O3A: Optics for Arts, Architecture, and Archaeology II. Bellingham, WA: SPIE, vol. 7391, pp. 739106–12. 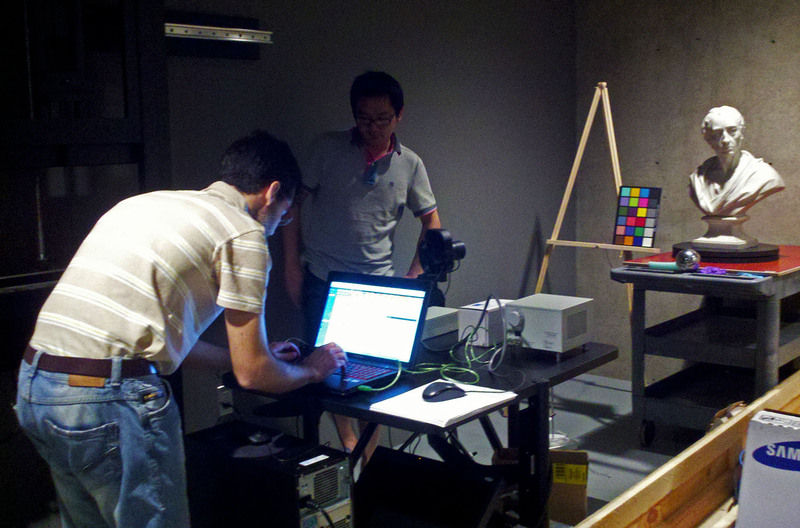 This is the setup used to multispectral scan a manuscript at the Beinecke library. 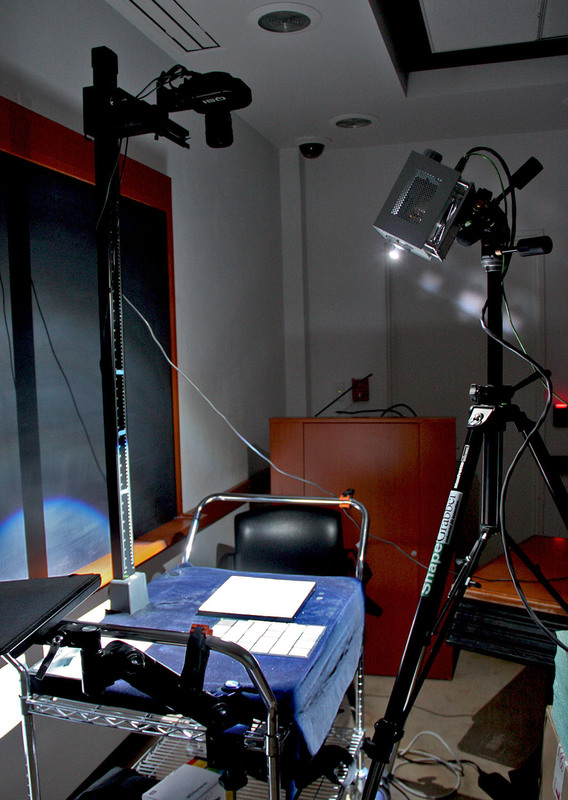 The multispectral camera is mounted on a copy stand with a 1 meter column. The xenon light (UV) source is mounted on a separate tripod. Color targets are used to callibrate the camera. Once this is completed, the manuscript will be laid out on the copy stand and images of each page will be taken one at a time. 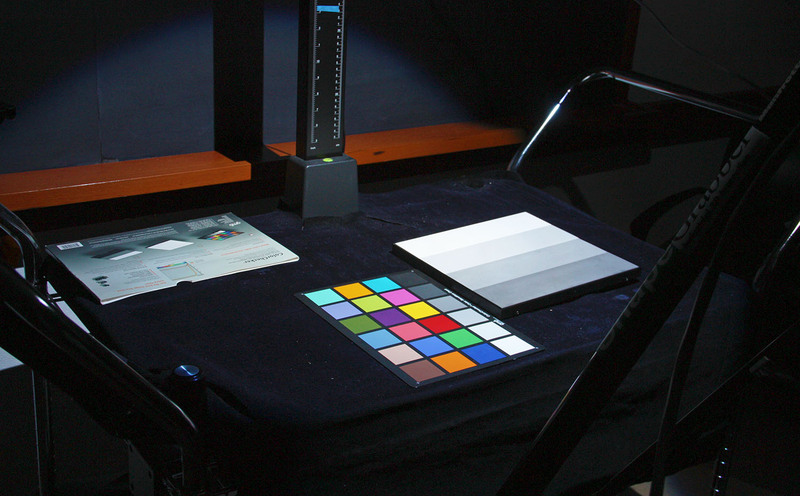 The color target and spectralon (white and grey target) are used to help callibrate the 8 multispectral camera filters: 6 in the visible range, 1 in the ultraviolet (UV) range and 1 in the infrared (IR) range. This photo shows the manuscript open so the right pages can be acquired by the multispectral camera. The manuscript is supported by foam as the book is rotated and the photographing of the left pages begins. A velvet ‘snake’ weight is used to the hold the right pages down so that they don’t move into the shots of the left pages. This is a closeup of a section of the Gower manuscript. This is a closeup view of some of the intricate scrollwork found in the Gower manuscript.